On Pentecost Sunday, 4 June 2017, Holy Eucharist Parish acknowledged one of its longstanding members Dr. Semeon Hrushovetz. “Dr. 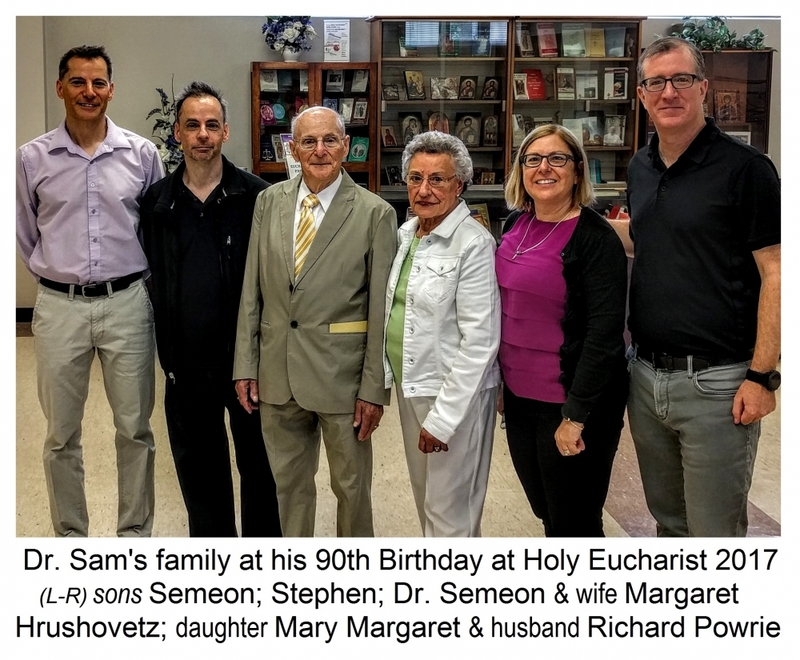 Sam” as he is affectionately known to everyone, was celebrating his 90th Birthday and Parishioners wanted to honour him in some small way. As usual, Parish Priest, Fr. Michael asked at the end of the Sunday Divine Liturgy if anyone one was celebrating a Birthday or Anniversary. Of Course, as was found out ahead of time, Dr. Sam was one of them. The congregation sang out a wall-shaking Mnohaya Lita! After the Liturgy, everyone was invited downstairs “for little a special event”. 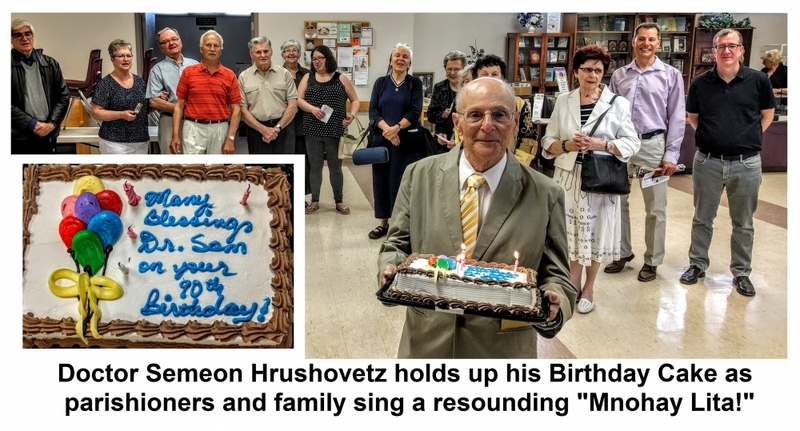 What awaited was a surprise birthday celebration for Dr. Hrushovetz. He and his wife Margaret are known for their generous donations in support of education and, of course, medicine. Dr. Sam was awarded a lifetime Honourary Membership in the Canadian Medical Association. This is awarded to physicians who have, “attained eminence in medicine, science or the humanities”. He has an additional love for history and is often participating in historical groups and lectures – and he is often the go-to expert in many fields. At Holy Eucharist, he was the keynote speaker at the unveiling of the plaque in commemoration of the 100th Anniversary of the Internment of Eastern Europeans – many Ukrainians among them during the First World War. He has made phenomenal accomplishments in research over the years, but one of Dr. Sam’s greatest interests is the whole science behind the question of aging and life extension. You must visit his ‘DocSam’ blog [HERE] to get an idea of his ongoing research and writing. God bless you and your family, Dr. Sam, for many more wonderful and successful years. Многая Літа!